Just 3 days after Christmas we already started to get antsy to start our bathroom renovation. Our tree and decorations aren't even put away! 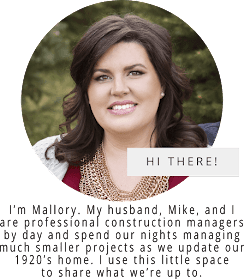 We've talked about starting to shop now for the new bathroom and that way we can take our time and find some good deals and also keep our wallets from feeling a giant withdraw all at once. So, when I found these puppies, which have the same look that we wanted, (and I talked about back in April in this inspiration post), we wanted to leave work and go buy them right away. Of course real life doesn't work that way, and we need our jobs to pay for these projects, so Mike and I emailed each other back and forth talking about different configurations and used inspiration photos from the web to talk our ideas through. After a quick measurement of the existing cabinets on my lunch break, we were ready to go see them in person. Sorry for the funky angle, it's hard to get a shot of the entire vanity. 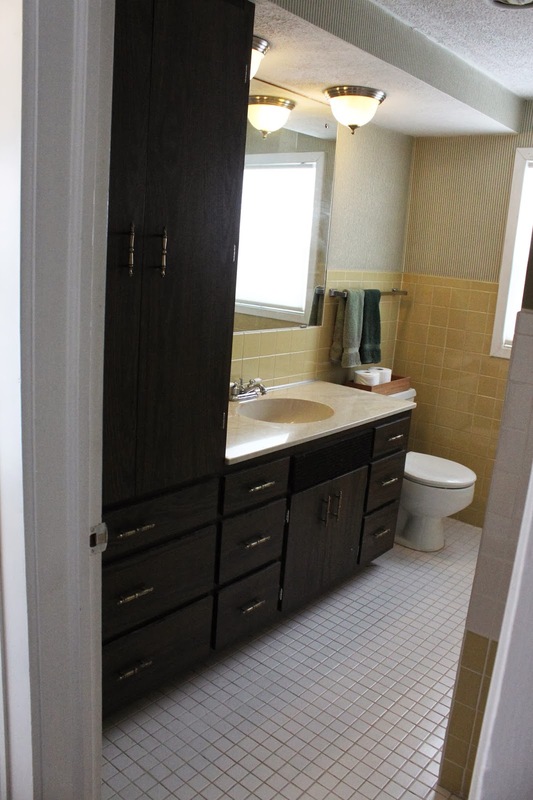 The vanity now is 76" long and it leaves the toilet feeling a little cramped. We definitely are going with two sinks, so I started with the sink bases and added a drawer base in the middle. 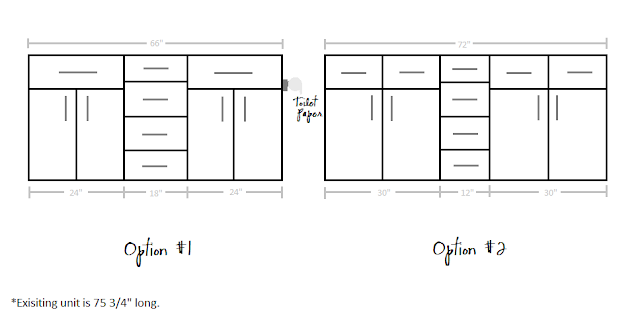 Option #1 has two 24" sink bases and an 18" drawer base for a total of 66" long. Option #2 uses two 30" sink bases with only a 12" drawer base in the middle totaling 72". Since we have two sets of drawers on either side of the sink now that we use more than the under sink cabinet, I knew it was more important to have more drawer space than cabinet space. 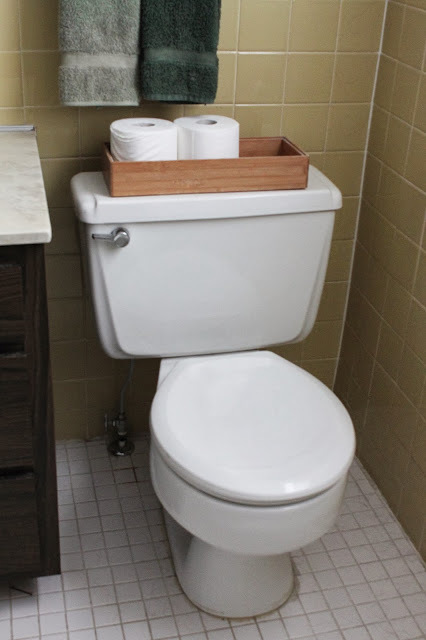 The added bonus that we could move the toilet paper holder to the cabinet side, making it not the first thing you see walking in, made Option #1 the clear choice. Allowing about 6" for the toilet paper and holder, we're only at 72" long and an extra 4" for the toilet that we don't have now. The only problem I saw choosing Option #1 was this sink from Ikea, that we had mentally chosen, was 24" long. That means that it would take up the entire 24" sink base cabinet. And, the side of the sink on the left side of the vanity would sit right up against the wall. Not exactly what we had in mind. 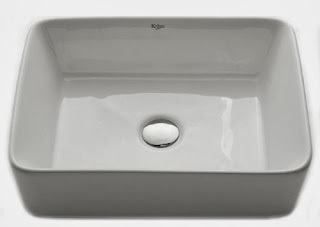 So, I quickly did some sink browsing and found some other options like this one from Overstock.com, that's only 18.8" long, leaving some space on each side of the counter. A little more money than the Ikea one, but overall worth it for the look and function. Okay, back on track, as soon as we got out of work, we ran over to Building 9. I was a little dejected when I saw that they only had the cabinet above, (which I think is the 36") and not the 24" sink base, or any drawer bases. I kinda stood there frozen, literally, since it was 27 degrees outside and it's a giant unheated warehouse, until one of the workers came by and told me the could order any of the sizes and styles for us. It's a little like Re-Store where they get surplus items and once they're gone they're gone sorta thing, so I was excited to hear that they have some suppliers that they order from and regularly have in stock. For a $25 shipping charge (per order, not per item) I could get any configuration we wanted. After a little misunderstanding with the internet price vs. the catalog price, (which they honored the lower internet price), we had ordered a 66" vanity for the bathroom upstairs. With the New Year's holiday we'll have to wait a little longer for delivery, but we should see them in about 2 weeks. I'll be sure to let you guys know when they come in, and keep you up to date on any other bathroom purchases. Or, if we go crazy and start demolition. Just kidding...I hope. 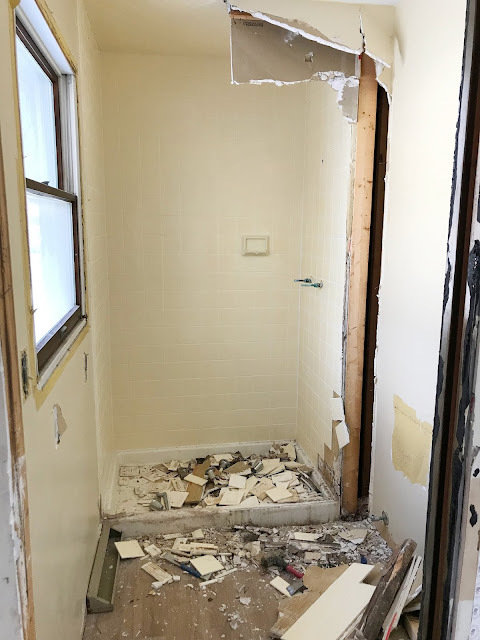 Good luck with all your bathroom DIY projects! It's always so exciting to start a new project. =) Happy New Year! Thanks Morgan! We are so excited to start the bathroom. I'm not sure if it's to take on another project, or if we're just tired of living with the ugliness! Thanks for becoming a follower, I checked your blog out and became a follower too! Hope you're enjoying figuring out your new camera as much as I am!